Ursula K. Le Guin took readers to imaginary worlds for decades. In the last great frontier of life, old age, she explored a new literary territory: the blog, a forum where she shined. The collected best of Ursula's blog, No Time to Spare presents perfectly crystallized dispatches on what mattered to her late in life, her concerns with the world, and her wonder at it: "How rich we are in knowledge, and in all that lies around us yet to learn. Billionaires, all of us." URSULA K. LE GUIN is the recipient of a National Book Award, six Hugo and five Nebula Awards, the Kafka Award, a Pushcart Prize, and the Harold D. Vursell Memorial Award from the American Academy of Arts and Letters. She lives in Portland, Oregon. 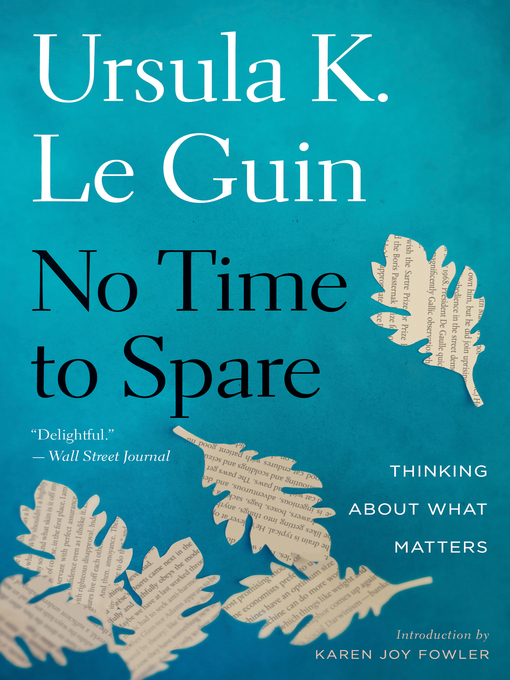 A legendary writer with a National Book Award, five Hugo Awards, and five Nebula Awards to her name, Le Guin here collects the best essays from her blog, a new medium for her that fits her pointedly glistening writing. In particular, she addresses the frontier of old age, both its hardships ("If I'm ninety and believe I'm forty-five, I'm headed for a very bad time trying to get out of the bathtub") and rewards ("How rich we are in knowledge, and in all that lies around us yet to learn. Billionaires, all of us"). With a 30,000-copy first printing. Fantasy and SF author Le Guin (The Lost and the Found) mines her blog in these short, punchy, and canny meditations on aging, literature, and cats. Prompted by an alumni survey from her alma mater, Radcliffe, that asks how she occupies her spare time, she takes issue with the idea that any time occupied by living—whether that means reading, writing, cooking, eating, cleaning, etc.—can be considered spare. Moreover, with her 81st birthday fast approaching, Le Guin declares, ”I have no time to spare.” One of the most personal pieces lovingly describes Le Guin’s adoption of a kitten from the local Humane Society, describing how the “vivid little creature” eventually settled in the house and became her “pard” (partner.) 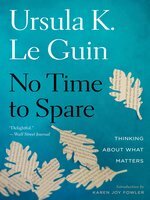 On literary topics, Le Guin contests the preoccupation with finding the next Great American Novel—“We have all the great novels we need and right now some man or woman is writing a new one we won’t know we needed till we read it”—and responds to a reader’s question about the meaning of one of her books by responding that its meaning is up to the reader. In a prescient 2012 essay on lying and politics, she wonders whether America can “go on living on spin and illusion, hot air and hogwash, and still be my country.” Le Guin reveals no startling insights but offers her many fans a chance to share her clear-eyed experience of the everyday. Agent: Ginger Clark, Curtis Brown. Spirited, wry reflections on aging, literature, and America's moral life.Inspired by blogs that Jose Saramago wrote when he was in his 80s, the prolific, multiple award-winning Le Guin (Words Are My Matter: Writing About Life and Books, 2000-2015, with a Journal of a Writer's Week, 2016, etc.) became a blogger herself. In an entertaining collection of more than 40 posts written from 2010 to 2015, she offers opinions on a wide range of topics: politics, age and youth, confounding questions from readers, creativity, public and private expressions of anger, a splendid opera by Philip Glass, the serene ritual of breakfast in Vienna, and, most charmingly, her cat. The collection begins with the author's mystification over a questionnaire from Harvard, on the occasion of the 60th reunion of the graduating class of 1951. One question "really got me down," she confesses: "In your spare time, what do you do?" There followed a list of 27 occupations, beginning with "Golf." If spare time is the opposite of occupied time, Le Guin maintains that all of her time is "occupied by living." And at the age of 81, when the piece was posted, she observed, "I have no time to spare." She is at her most acerbic when writing about politics: in 2012 she learned that in 1947, President Truman asked the nation to give up meat on Tuesdays and poultry on Thursdays so that grain could be sent to starving Europeans. Such a request would be laughable today, she reflects sadly: "When did it become impossible for our government to ask its citizens to refrain from short-term gratification in order to serve a greater good?" Even in 2012 she felt in exile: "I used to live in a country that had a future." Le Guin is at her most tender in posts about her cat, "a vivid little creature...utterly sweet and utterly nutty." Thoughtful musings from a deft and sharply insightful writer.